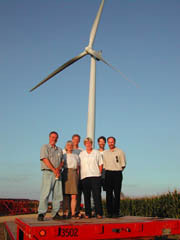 RENew Northfield formed in March, 2001, as an ad-hoc grass-roots organization comprised of local citizens interested in exploring the options available to promote local development of renewable energy resources. We have been meeting regularly and communicating extensively via email since then on our listserv, which is hosted by Northfield Citizens Online. RENew Northfield incorporated as a nonprofit on December 5, 2001 and was granted tax-exempt 501(c)(3) status in 2003. There has been broad support in the community for the concepts advanced by RENew Northfield since its inception. Our initial organizational meeting was attended by 23 area residents from all walks of life, ranging in age from young adults attending college in town to retirees in their 60s and 70s. Subsequent meetings have had good attendance with diverse representation as well. RENew Northfield’s mission is to lead the Northfield-area community to energy self-sufficiency. RENew Northfield envisions an energy self-sufficient community that produces its own energy using a variety of methods that are environmentally friendly, of benefit to the local economy, and socially just. Conservation and responsible energy use are also central to this vision. We foresee Northfield becoming a model for other communities working toward energy self-sufficiency. Energy needs must be met without harm to the environment. All of the community’s energy needs must be provided by non-polluting, renewable sources which are used efficiently. Economic benefits from the production and use of energy should accrue primarily to the local community. The community should determine and share the responsibility for how its energy is produced and consumed. All community members should be ensured access to affordable energy provided in a way that does not harm human health, the environment or the well-being of others in the world community.